Andrew Craig is an associate professor of biomedical and molecular sciences at Queen's University, Ontario. His research interests include cancer biology, immunology and therapeutics. Fresh off an election win in 2015, the Trudeau government won the support of the Canadian research community with a declaration that science and evidence-based decision making was back. Early action included the appointment of Canada’s first minister of science, and a modest increase in funding to the federal agencies that administer federal research funds in their first budget. While disappointed with the magnitude of investment, the research community rationalized that much more substantive changes to science funding would require more time, and hoped for an evidence-based process. To this end, Science Minister Kirsty Duncan commissioned a review of federally funded research led by David Naylor and a panel of university administrators and distinguished researchers, including Nobel laureate Arthur McDonald. The report was delivered in late 2016. But the official release was delayed until early April 2017, after the government presented its second federal budget with no new funds for Canada’s three federal research agencies, commonly referred to as the tricouncil: Canadian Institutes of Health Research (CIHR), Natural Sciences and Engineering Research Council of Canada (NSERC) and the Social Sciences and Humanities Research Council (SSHRC). In fact, there was no mention of these funding agencies or the importance of fundamental research in the 2017 federal budget, despite a major focus on innovation, which inevitably builds on fundamental discoveries. Instead, Ottawa continued the trend of previous governments to support directed funding for specialized themes, including $6 million for stem-cell research, $81 million for space exploration, $10 million for quantum computing and $35 million to support international collaborations. This approach amounts to picking winners, and ignores the value of broad support for the science ecosystem. To this day, there has been limited endorsement of the Naylor report recommendations by the Canadian government. Some suggest the science minister and the Naylor report failed to make a compelling case that a major reinvestment of $485 million dollars annually — less than 0.1 per cent of GDP — is needed to restore funding for fundamental research to 2005 levels. Duncan was slow to endorse the report and appeared to question whether funding recommendations should be left to elected officials — surprising since she herself commissioned the report, and it provides the basis for evidence-based decisions on how to bolster Canadian science funding and delivery. 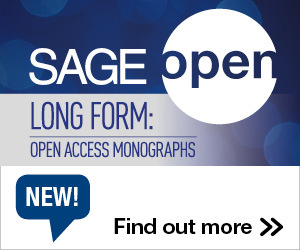 Instead, a grassroots effort among Canadian researchers led to the organization of town hall meetings across Canada where researchers weighed in on their concerns. These forums revealed how dire the funding situation is for researchers, especially for those in early and mid-career positions who are attempting to build or sustain their research program. 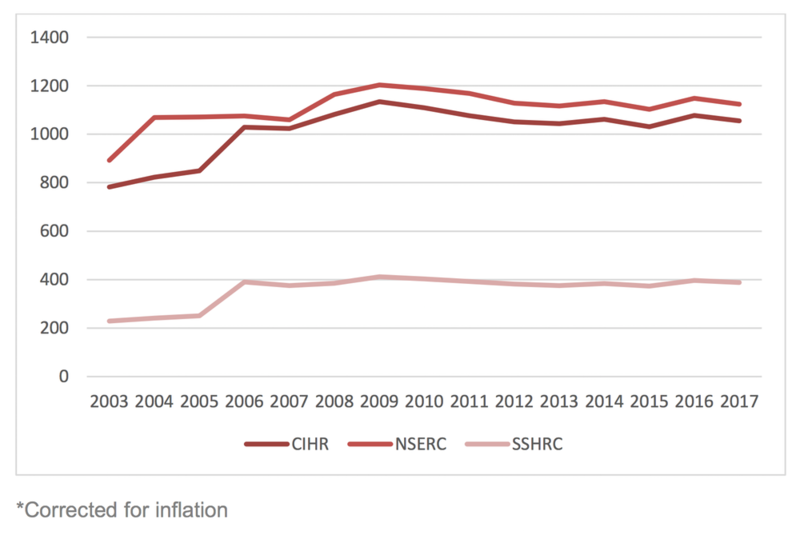 Research funding in Canada has remained relatively flat. The meetings also demonstrated that the research community strongly supports implementation of all recommendations in the Naylor report. “Support the Report” became a mantra taken up by many Canadian scientists on social media and in meetings with government officials. We collectively met with most federal MPs and ministers and often found ourselves educating them on the Naylor report — even those within the Liberal government. Since then, there has been no evidence that the science minister or the prime minister will provide the budget support needed to enact the report’s recommendations. This was certainly a failing of the Harper government, and still largely applies to the science policy of the Trudeau government, despite the warm platitudes of how they value science. It is time for the Canadian government to move past boutique programs and photo-ops. Without new investment in unfettered research funding to the tricouncil agencies, we will see generations of highly skilled scientists leave Canada or choose another career. This will further the steady decline in Canada’s reputation for world-class research. It also has the unintended consequence of stemming the flow of new discoveries that feed into the innovation sector. Recently, several positive steps on the science portfolio have included appointment of Canada’s chief science adviser to the government and a Canada Research Coordinating Committee. These are promising developments, but without a major increase in federal funding, the research ecosystem will remain on life support. It is now 2017, a time for evidence-based decisions in science policy. 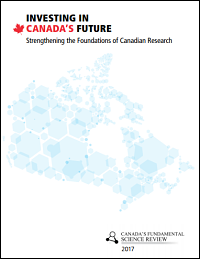 It is time for the Canadian government to demonstrate they are moving ahead with all recommendations from the Naylor report to return balance and support Canadian science in all its wonderful diversity. This entry was posted in Academic Funding, Public Policy and tagged Canada, Evidence-Based Policy, Naylor Report, The Conversation. Bookmark the permalink. Post a comment or leave a trackback: Trackback URL.